CTPD Head of Programmes, Brain Mwiinga has since called on regional trading blocs to help in resolving the situation so that the trade is not disturbed further. Mr. Mwiinga disclosed that many countries in the African region depend on each other for different goods and services adding that, any disturbance in one of them has a direct impact on intra-trade. He told ZANIS in an interview in Lusaka today, that many small scale cross border traders in the country frequent the two countries for various business activities. He added that this is why there is need the Common Market for Eastern and Southern Africa (COMESA) and the Southern Africa Development Community (SADC) to press governments in the two countries to quickly resolve their differences. Mr. Mwiinga noted that for continued smooth trade integration to be achieved, it will be dependent on the governments in the two countries to amicably find solutions to their problems. Zimbabwe has in the past days recorded unrests following government’s decision to increase fuel pump prices by about 150 percent. Zambia is headed there with the reconciliation efforts apparently under ransom. @Now Trending, Zambians just vote for their leaders and let the cry babies cry while life continues. There is nothing to reconcile about in Zambia. Lungu won and is the sitting president until the next elections. In 2021 Zambians will decide whether he continues or let someone else take over. Nonsense. Just because our neighbours are in turmoil doesn’t mean we have to be in the same situation. Zambians have always been able to uphold peace and stabilty within the country and shall continue to do so for the good of the whole region. Don’t deceive yourselves, peace is tender and should be careful preserved. Zambia has been there before. Where were you in 1990 when we fought for our freedom? You clearly were not there. Freedom is God given and should not be taken away selfish cohorts at the expense of others. I do not know what rock you live under, but I suggest you leave it and absorb some sunlight. Your brain is becoming dull. Zambia is fine, it is just under going growing pains. The opposition in Zambia are the useless culprits. PF is just dis-functional at most things. All will be well. 1.3 in 1990 I was in employment and don’t remember anyone fighting for our freedom. ….1964 yes but certainly not 1990. Please don’t compare those skirmishes you had with Kaunda’s ZP to the troubles in the DRC. These are two different situations. In the 80 ,90s who knew that zimzim will ever see such,zambians used to flock to zimzim for peace and essential commodities.nothing is gauranteed bwino especially if the administration shows same dictatorial tendencies like whats happening in zambia over the past few years.lets all love one another and be pragmatic in our way of life. @2planzo, Zambians have never gone to another country to search for peace! !Yes we used to go and search for essential commodities but we have been living,even suffering peacefully!! RE: STOP ZIMBABWE DICTATOR ‘PRESIDENT’ EMMERSON MNANGAGWA AND HIS DELEGATION FROM ENTERING SWITZERLAND DUE TO HUMAN RIGHTS VIOLATIONS. The Zimbabwe ‘President’, Emmerson Mnangagwa and his delegation, will be arriving in Switzerland for the World Economic Forum Summit in Davos. This is amid torture, abductions, brutality by state apparatus (military, police, Central Intelligence Organisation and ruling party ZANU PF hit squads) currently underway in our country. 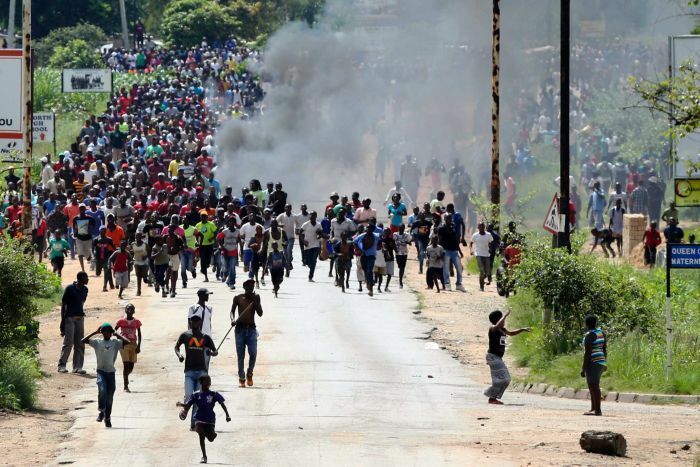 Zimbabwe citizens are being slaughtered, using live ammunition, like chickens, in the townships, yet Switzerland will allow the President Mnangagwa who is responsible for such massacres to eat, wine and dine on their soil. The number of those arbitrarily arrested exceeds 500 so far according to Zimbabwe Lawyers for Human Rights [ZLHR]* and Zimbabwe Doctors for Human Rights [ZDHR], and these include minors. These organisations have issued a statement saying they are treating hundreds of injured civilians for various violence related injuries. The number of deaths is not yet clear as communication is being tampered with and manipulated by state agents. … Zimbabwe state security arms in association with militant Zanu pf Hit squad reaction is disproportionate for the required level of engagement. The whole World understands and appreciate the fact that Switzerland prides herself as a neutral country. However, the clear evidence of state sponsored massacres currently happening in Zimbabwe need acknowledging. ‘President’ Mnangagwa and his delegation must be barred from entering your country under humanitarian reasons. … Hence, by denying them entry now, ‘President’ Mnangagwa and his cronies will head home tails between their legs. The clear message from your government may be instrumental in ending these Human Rights violations, as it once did before. On behalf of other activists Karen Nhakaniso , Delina T Mutyambizi , Precious N Moyo , Olive R Ruzvidzo, lilian Nleya Representing Restoration of Human Rights ( ROHR ZIMBABWE) a charity that defends rights in Zimbabwe. 2.0 Please don’t mislead and over amplify things just because your man has failed to make it to State House. You people surprise me…..there’s no dictatorship in Zambia. Go to Botswana or Namibia and you will never find anyone insulting their presidents the way Lungu is insulted. In Tanzania the president is ruling by decree in the name of fighting corruption. In fact the only country around which is better than Zambia is South Africa. The others are either open dictatorships or silent dictatorships like Namibia and Botswana. @Break News we told you that your celebration on the down fall of RGM was premature. You just replaced a plastic crocodile with a real one.